Tip: Let it rest! After cooking your delicious burger let it rest for 3 or 4 minutes. This allows the juices on the exterior of the burger redistribute making it extra juicy when you take your first bite! Summer is finally here!!! This month we thought we would share with you our secrets to the perfect beef burger just in time for BBQ season. And there’s nothing wrong with a little indulgence! 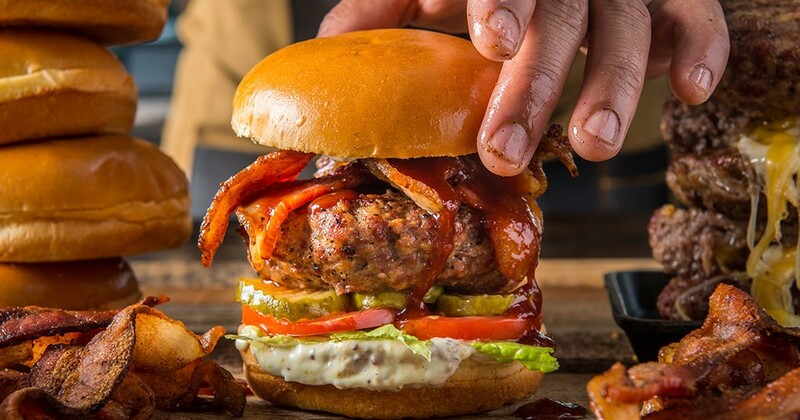 Before we tell you the what ingredients we’re using in our Ultimate Burger here’s 3 top burger cooking tips…. If you’re planning on mincing your own burger blending different muscles can influence the burgers texture and make it extra tasty. Practice getting the balance just right for the perfect patty. Meat to fat ratio is hugely important, 70:30 ideally, but no more than 80:20!! Press down lightly in the centre of the patty with your thumb before you cook it. The slight indentation helps your burger to form perfectly and avoids the centre puffing up as it cooks. As your meat cooks the centre will expand and create a fantastic mouth-watering burger. We all get tempted to press down on the burgers when cooking them but try your best to avoid this as each time you press them you’ll be squeezing out the juices and drying them out. Getting the right bun for your burger can seal the deal. Brioche buns are all the rage in the funky burger bars at the moment and they are amazing. Whatever buns you choose make sure they are fresh and lightly toasted. Finally, it’s important to get the cooking temperature of your burger just right. Always use a thermometer to make sure your meat is cooked properly. This is only relevant for meat you have minced yourself in a chilled environment, if using shop bought mince, always cook all the way through. Here’s a rough temperature guide for burgers…. Medium:8 minutes 60°C (140°F) for medium. Medium-well:9 minutes 66°C (150°F) for medium-well. Well-done:11 minutes 71°C (160°F) and above for well-done. Now let’s take a look the ingredients you’re going to need…. Preheat the grill to 230C. If using charcoal, light early in the day and allow to cook down to glowing white. Combine all the ingredients for the burgers holding back the salt & pepper (as they will draw out moisture), form (without overworking the meat) the burgers into 100g patties, place on to parchment paper, wrap with clingfilm and store in the fridge for an hour. Prepare all the toppings, including grilling the bacon until crispy, set the bacon & cheese alongside the BBQ grill. Place a pan of cold water on high heat and add the potatoes, bring to the boil and cook for 5mins, drain and allow to steam dry. On a large square of tinfoil, mx the olive oil and rosemary and toss the potatoes in the mixture, loosely wrap the foil and place at the back of the grill. After 45mins, open the foil add the parmesan and truffle oil, give a quick shake and cook for a further 5mins. Remove the burgers from the fridge 20mins before you intend to cook them, now it is time to season the burgers well, grill on either side, only turning once, do NOT be tempted to press down on the burgers as this will cause moisture to escape. Once they have been flipped, add the cheese and bacon and close the lid of the BBQ. Cook for 4-5 mins each side, ideally you want them just medium well in the centre. (NB, always allow your cooked meat to rest for half the cook time!). While the burgers are resting, brush the buns with melted butter and grill until toasted golden brown. Allow each guest to build their own burger as they see fit, serve alongside the truffle parmesan potatoes and a cold beer, you’ve earned it! We hope you have fun making the ultimate burger and even more fun eating it!! Pop back soon to see what our chefs will be cooking next…..